The Samsung Wine Cooler Refrigerator, Model RW13EBSS is an attractive mid-capacity home wine cellar in which you can store and keep cool about 28 – 31 bottles of wine. Made by the Korean-based Samsung, a leader in manufacturing electronics, digital products and home appliances including washing machines, air conditioners, vacuum cleaners and now wine refrigerators, you can expect high quality from Samsung RW13EBSS. The wine fridge by Samsung was designed to provide proper storage conditions for wines protecting your prized vintages from direct sunlight and keeping them cool or chilled so that you can pick one of your favourite bottle and have ready-to-serve wine on hand at any time. Great when you have unexpected dinner guests!This cheap wine cooler made by Samsung is available in the European market in most larger UK home appliance stores. 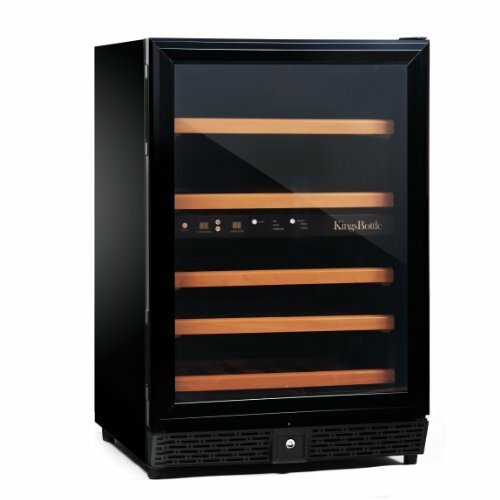 The black cabinet of the wine cooler has a see-through tempered glass door with stainless steel-like trim. The door glass is doublepane for good thermal insulation. The door opening can be reversed allowing you to find the most suitable placement in your home. The door includes a lock and key set so you can keep the cabinet closed to prevent children from accessing your wines. The door features recessed handle for a more trimmed and clean look. 5 chrome-plated wire racks cradle the wine bottles providing safe storage. The racks can be pulled out so that you can stock up the cabinet and/or pick and get a bottle of wine easily. There’s a 6th lower shelf for display purposes The incadescent light inside the cabinet – that you can turn On/Off by the push button light switch on the control panel – illuminates your collection nicely. if you leave the light on by accident it will automatically turn off after 1 hour. You can set and monitor the temperature on the elegant and easy-to-use touch pad control panel integrated in the top frame of the cabinet. You can use the factory set White Wine and Red Wine Settings but you can adjust the unit to other temperatures. When you plug in the unit for the first time it will automatically set on Red Wine mode (13°C) the indicator next to the Red Wine will light up and the blue digital display shows the current temperature. In White Wine setting the wine refrigerator will cool to 7°C. To adjust the cooler to other temperatures simply press the Custom button for 3 seconds (the LED screen will show the actual temp. inside the cabinet) and you’ll be able to reach the desired temperature (by 1 °C increments) between 4 – 18°C by pressing the Up/Down arrows. 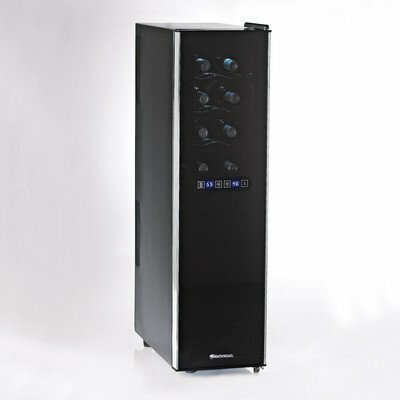 Energy consumption of the Samsung RW13EBSS wine cooler rerfrigerator: cc. 2.14 kW/24 hours so it’s not very energy efficient that’s why it received a C energy rating. Noise level of the wine cooelr: cc. 38 dB which is fairly quiet. For efficient operation place the wine fridge in the coolest spot in your home away from heat generating appliances and direct sunlight. Stand the unit on an even, solid surface. If necessary level out the appliance with the adjustable leveling legs. Make sure you leave enough space around the sides (min. 25.5 mm=1″)and at the rear (min. 51 mm=2″) of the cabinet for proper ventilation. The wine refriegrator requires a separate and grounded 220-240 V outlet. Price of the Samsung RW13EBSS Wine Cooler: cc. £180 – 300 (£6-10 per bottle), so it’s an inexpensive home wine cellar available mostly in the European market. Selection of the best-rated 30-bottle wine coolers. 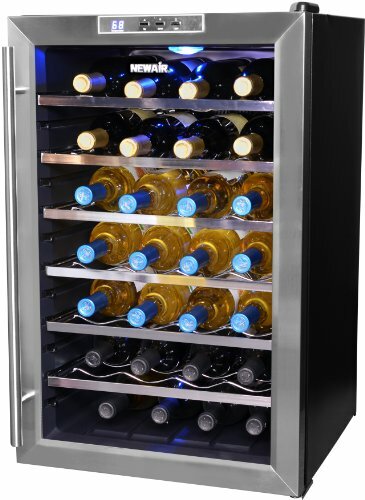 General Electric 29-Bottle wine cooler, Model PWR04FANBS – a quality single zone unit with display shelf. Avanti 28-Bottle Two-Zone Wine Cooler, Model WC331DZD – a dual zone wine cellar for freestanding or built-in placement. 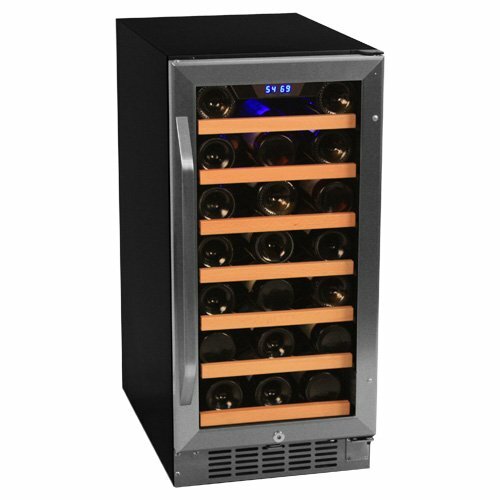 Danby DWC276BLS 27-bottle wine cooler – an elegant slim unit with 7 wood front metal shelves. EdgeStar 28-Bottle Wine Cooler – a thermoelectric unit with dark wood panel. Magick Chef 30-Bottle Wine Refrigerator – an inexpensive compressor-operated unit for standalone placement. 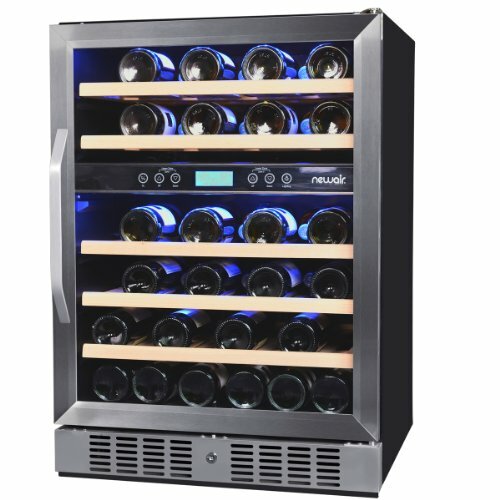 Vinotemp VT-28TEDS Wine Cooler – single-zone, thermal electric unit with 28 bottles capacity.